Long before the start of the Second World War it had been believed that strategic bombing would be the deciding factor in any future conflict. Then Hitler launched the Blitzkrieg upon France and the Low Countries in 1940, and the much-vaunted French Army and the British Expeditionary Force were swept away in just six weeks.This new form of warfare shook the Air Ministry, but the expected invasion never came and the Battle of Britain was fought in the air. It seemed that air forces operating independently could determine the course of the war. An Army scarcely seemed necessary for the defence of the UK and no British army could ever be powerful enough to mount an invasion of Europe on its own. Bombing Germany into defeat seemed Britain's only option. In North Africa, however, Commonwealth armies and air forces were demonstrating that they too could use blitzkrieg tactics to crush opponents. 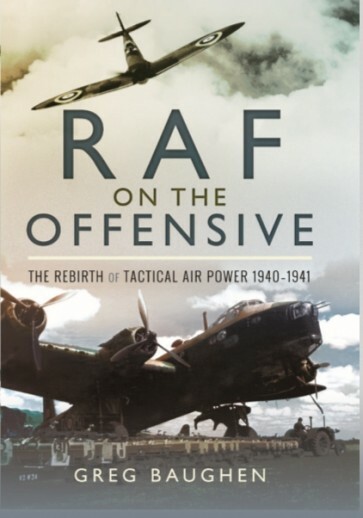 Britain was also no longer alone; Greece and then the Soviet Union joined the fight.RAF on the Offensive describes how British air power developed after the Battle of Britain. Attitudes were beginning to change – the fighter, rather than the bomber, was re-emerging as the principal means of gaining air superiority. As 1941 drew to a close, the strategic air offensive appeared to be achieving little and conventional land warfare seemed poised to replace it as the way to defeat the enemy. Which direction, then, would the war take? Greg Baughen was educated at Sussex University where he obtained a degree in Mathematics. In a varied teaching career, he has taught Maths and English as a Foreign Language, to children and adults, in Britain and abroad. His interest in military aviation was sparked at a very early age by curiosity over the defeat of British and French air forces in the Battle of France in 1940. For forty years, he has delved though public archives in Britain and France seeking explanations. The quest has taken him back to the origins of air power in both countries and forwards to what might have been in the Cold War. He then set to work writing a definitive history of air power in both countries.